October 9, 1998: More baseball. Threw in an obvious "Hello, Cleveland!" Spinal Tap reference, probably because I was getting bored with baseball playoff promos. This is probably also a good time to admit to something that happened earlier in the playoffs: I forget which matchup it was, but I got one of the teams wrong. 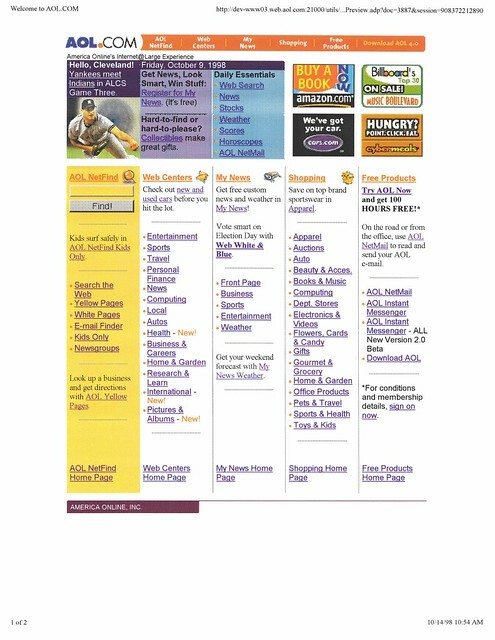 We only found out that I'd put one of wrong teams into the playoffs after some members posted about it to the AOL.com redesign feedback message boards, which we checked pretty regularly after every design change. We didn't really have a rigorous QA or editing process for content back then—I basically did it all myself.